When asked how he goes about carving life-like characters from a block of basswood, an old woodcarver replied, “I just whittle away everything that doesn’t look like it belongs.” Sculptors use similar imagery when they talk of “releasing” a sculpture from a slab of stone. Both describe a process that requires one to look beyond the obvious piece of raw material to see the beauty and artistry hidden from the casual observer. This is the process that Roger May and a group of contributing photographers have set out to do with Looking at Appalachia. Roger May was born in the Tug River Valley, a border land between eastern Kentucky and southwestern West Virginia. In the heart of coal country, the Tug River area is infamously identified with the Hatfield and McCoy families and The Battle of Blair Mountain. Roger’s mom, a struggling single mother on welfare, moved the family to North Carolina in search of steady work and financial stability when Roger was 14 years old. Other than a short stint with his dad in Kentucky, Roger spent his high school years in North Carolina. A student at Athens High School in Raleigh, he went on to receive a basketball scholarship to Montreat College in the mountains of western North Carolina. But college classes sandwiched between morning and evening practices wasn’t how Roger envisioned spending his days. He left school and married at age 19. Six weeks later the young couple discovered they were expecting their first child – a daughter. Roger joined the Army and a couple of years later their son was born while they were stationed in Alaska. During his seven years of military service, Roger always found himself in or near mountains. After his military days were behind him, his desire was to move back home to West Virginia. But, employment opportunities were limited. Now a single father, as his mom before him, he needed a career that provided stability for his family. He found himself back in North Carolina, and currently works in Information Technology (IT) in local government. Married now for three years to what he describes as “a great West Virginia gal,” Roger and his wife have a blended family of four children spread from college to elementary school. Each of these life steps whittled away chips from the raw blank that was becoming Roger May. As the chips piled around his feet, his life’s purpose became more defined. At age 29, Roger began a serious pursuit of photography as an art form. High quality digital cameras had become more commonplace. The digital format allowed for affordable practice and experimentation. Largely self-taught, he used his emerging skills to reinforce his sense of memory, place and connection with his West Virginian roots. As he examines the totality of his photographic work, it is obvious to him that his captured images are largely autobiographical. Roger describes his photos as a collection of people and places he misses from the mountains. After seven years of honing his craft, Roger sorted through over 10,000 photos and began a long series of edits. The resulting work was a photobook entitled Testify which he describes as, “A visual love letter to Appalachia, the land of my blood.” He used Kickstarter, a crowdfunding platform, to breathe life into the project. But, Roger’s desire is to reach a much broader audience on a topic near to his heart. For several generations, images of barefoot children and haggard women on the porches of broken down homes reinforced the stereotype of Appalachia as a poverty stricken region filled with feuding, toothless hillbillies. Pop culture contributed to this imagery by way of Li’l Abner and Snuffy Smith comics, and films such as Deliverance. Looking at Appalachia is an effort to combat those negative stereotypes. The contributors’ photos are all current for the year of submission and represent the vast diversity Appalachia. They hope this project generates conversation about our cultural heritage, and helps promote and further a sense of pride in our region. Photographer Kristian Thacker. April 25, 2014. Snaggy Mountain Farm, Burnsville, Yancey County, North Carolina. So, is our cultural pride missing, taken for granted or just underdeveloped? If so, how do we develop or enhance pride in a way that is positive and productive? Maybe a more important question to ponder is whether our perceptual challenges are internal, external, or combinations of both? These are the types of discussions this project hopes to generate in our communities. While the woodcarver or sculptor may have a clear vision for what they hope to make from that wooden blank or block of granite, the reality is that the characteristics of the wood or stone dictate the finished product. These mountains are nothing more that wood and stone. The people here are a product of these mountains. Pride doesn’t come from trying to hammer us into something we are not. Pride comes from celebrating who we are. Looking at Appalachia is a celebration of mountain life. 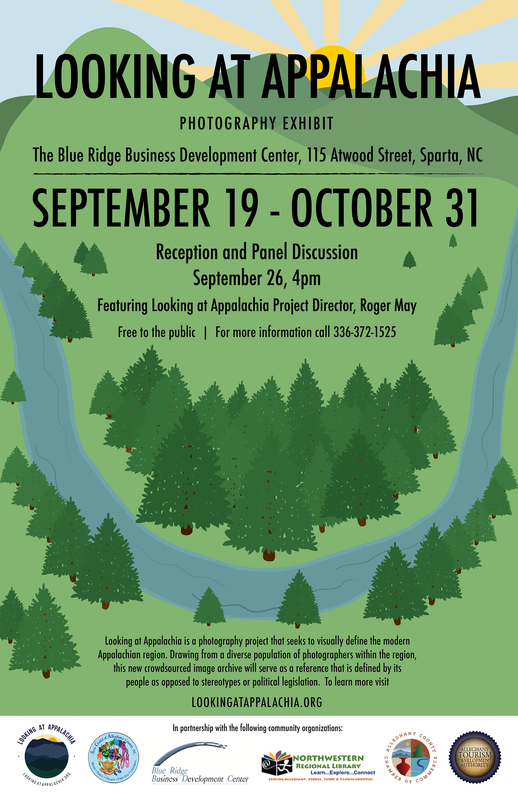 We are fortunate to host an exhibition of 75 photographs from the Looking at Appalachia project at the Blue Ridge Business Development Center (BDC) in Sparta, NC from September 19 through October 31, 2015. A reception and panel discussion of the project will be held on September 26, 2015 at 4:00 pm at the BDC. To learn more about Roger May visit www.walkyourcamera.com or www.rogermayphotography.com. You can also follow him on Facebook and Instagram. Ooops. I just read at bottom-you have posters. I want one. Thx! I will get one down to you this week.